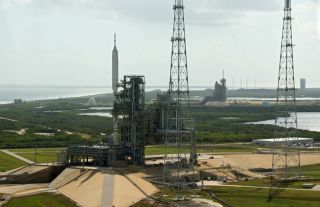 At NASA's Kennedy Space Center in Florida, the 327-foot-tall Ares I-X rocket (left) awaits a late October 2009 liftoff on Launch Pad 39B on its upcoming flight test. In the distance are space shuttle Atlantis (right) atop Launch Pad 39A, and the pads and processing facilities on Cape Canaveral Air Force Station. New NASAphotographs have revealed a rare, and ultimately fleeting, glimpse at a pair ofrocket ships ? an old space shuttle and a gleaming rocket prototype ? on twodifferent launch pads in Florida. In the newphotographs, taken Oct. 23 from a helicopter, the two launch vehicles standpoised for blast off on seaside pads at NASA?s Kennedy Space Center in Florida.One is the space shuttle Atlantis, which is being primed for a planned Nov. 16flight to the International Space Station. The otherrocket is the unmanned Ares I-X ? a suborbitalprototype of the new Ares I booster NASA plans to use to launch astronautsto low-Earth orbit after the shuttle fleet retires in the next year or so. Itis poised to launch Tuesday at 8 a.m. EDT (1200 GMT) from the Pad 39B,but only if the weather allows. A 60 percent chance of bad weather ispredicted, NASA officials said. NASAphotographers caught the gleaming white Ares I-X rocket at the modified Pad 39Bwhile Atlantis sat atop the nearby Pad 39A. ?People arevery excited,? NASA spokesperson Allard Beutel toldSPACE.com. ?Not only is that view unique, but it doesrepresent one of the fundamental roles of NASA. It?s doing space explorationand pushing those experimental craft forward.? Atlantis isa mere 1.6 miles (2.5 km) away from Ares I-X. Though the new rocket is anuntried vehicle, and so presents some risk of failure, NASA officials saidthey are comfortable with the arrangement, which they calculated to be about a1-in-10,000 chance of catastrophic injury to the shuttle if something goeswrong. The Ares I-Xrocket towers 327 feet (100 meters) over Pad 39B, which until recently hostedNASA shuttles but was originally built to host the mighty Saturn V rocketsthat sent astronauts to the moon in the late 1960s and 1970s. The rocket is 14 storiestaller than Atlantis and is the world?stallest rocket currently in service or ready to fly. In thephotos, Ares I-X is completely visible, a tall, slender booster that isskinnier on the bottom than at the top because its second stage ? a dummysegment for this test ? is thicker than the first stage solid rocket motor. Bycontrast, Atlantis appears short and squat. It stands at 184 feet (56 meters)tall, but only the back of its 15-story external tank is visible. The shuttleitself is shrouded by the protective Rotating Service Structure to guard itagainst rain and provide access to key areas. The lasttime NASA had two vehicles at the launch pad simultaneously was actually earlierthis year in May, when the shuttles Atlantis and Endeavour sat atop Pad 39A andPad 39B just before Atlantis launched to overhaul the Hubble Space Telescope. But it hasbeen 34 years since a rocket other than a space shuttle has sat atop a NASAlaunch pad. Beutel saidthe helicopter photo shoot caught a piece of history with the rocket snapshots.In addition to the one-of-a-kind Ares I-X rocket, two other unmanned boosters ?an Atlas 5 and a Delta 4 ? sit atop their launch pads at the nearby CapeCanaveral Air Force Station, he said. Thesuborbital Ares I-X mission is the first of three test flights, each moreambitious than the last, envisioned to lead to a fully operationally Ares Irocket and Orion spacecraft ? NASA?s shuttle successor. But thenext test flight, an Ares I-Y launch that would include a full second stageinstead of the mock-ups aboard Ares I-X, is not slated for any earlier than2014. Whether ornot Ares I will actually be the shuttle replacement remainsto be seen. President Barack Obama is currently reviewing the results of anindependent panel that surveyed NASA's future plans. He is set to make adecision soon about whether to proceed with Ares I and the rest of the Constellationprogram that plans to take humans back to the moon and beyond, or whether tosteer NASA in a new direction that may or may not include the rocket. That uncertainty,however, has not curtailed the enthusiasm around NASA?s Kennedy Space Centerfor the upcoming Ares I-X launch. Beutel said NASA doesn?t expect the samenumber of spectators as a shuttle mission, but the agency is expecting a largepublic turn out. ?Thousandswill be on-site here watching and other people will be turning out fromneighboring cities,? Beutel said. ?More than for a typical expendable launchvehicle for sure.? Editor's note: This story has been updated to correctly reflect that NASA launched the manned Gemini 11 mission while a test Saturn V rocket was on the launch pad in 1966. SPACE.comwill provide full coverage of NASA's Ares I-X test flight with Staff Writer Clara Moskowitz in Cape Canaveral, Fla., and Managing Editor Tariq Malik in New York. Click here for live launch coverage andmission coverage. Live updates begin Tuesday at 5 a.m. EDT (0900 GMT).